It has taken me awhile, but I had some other writing commitments to fulfill before I could sit down and hammer this out. 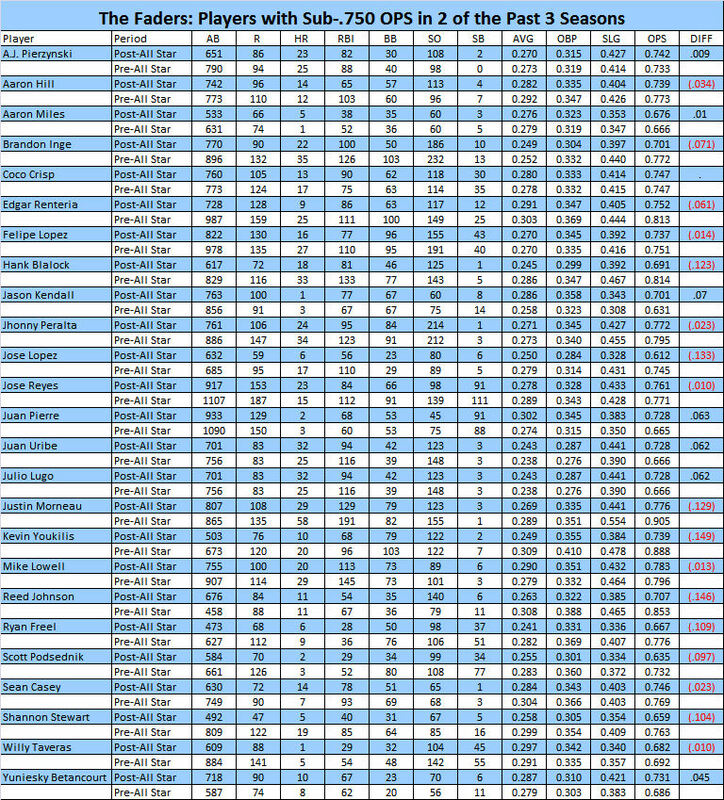 A few weeks ago, I covered the best hitters for the 2nd half over the past three seasons. That group of players has shown a penchant for performing very well after the All-Star Break. Whether or not some sort of switch comes on for them or if it’s anything more than a mere coincidence is up for debate. I feel that using a three-year sample does show that at least something is going on that should be noticed. Some players can’t stand the cold and need the blistering heat of July and August to get their bat going. Conversely, there is a group of players that don’t fare nearly as well after the break. Fatigue could be a big reason for this ineptitude. Given the way I gathered the data here, it could just be that they aren’t very good players in the first place. I pulled the sub-.750 OPS players with 200+ at-bats after the break from 2005-2007 and then isolated the players that appeared more than once. The first set of players are the ones that appeared all three times. There isn’t much Earth-moving information contained in the above table. You have a catcher, several middle infielders and Pedro Feliz as the three-time offenders. All of them fare worse after the break than they do prior to it, but not a single one is a prime fantasy contributor to begin with, so while they might be in your lineup depending on league settings they aren’t part of a foundation. The group of 25 players that follows appeared twice in the three-year span studied and within this list you will find some star power. The bulk of the list is still marginal mixed league talent and role playing single league players, but it isn’t completely useless to have a beat on who typically fades down the stretch. Notice immediately two of this year’s best players in Justin Morneau and Kevin Youkilis. Thus far, both are bucking their trend handily. Morneau has a .255 average since the break, but a power surge has led to a .979 OPS with four home runs and 19 RBIs. Youkilis has had a similar power output with five home runs and a .961 OPS since the break. It’s too early to say they have eliminated that trend from their profile as there are still two months of play left in the season. There are a lot of speedsters in this list and that is more a product of the fact that they don’t post very high OPS figures in general because they aren’t very powerful. That’s why I included the numbers before the break as a backdrop. I wouldn’t want someone to just see the names and think that the player is a guaranteed sell. Jose Reyes for example doesn’t experience a precipitous fall in production from one half to the next. Since they only appeared in two of the three seasons studied, that third season could have been a huge year that has their composite OPS over the .750-mark. I would like to look at the biggest drop-offs for the second half on a percentage basis as opposed to just the players that are below a particular figure. I think a project like that will take much longer and might something suited for the off-season with the 2006-2008 data. We shall see.